We all love a nice, warm cookie fresh out of the oven, but which type you reach for depends on where you live. This holiday season, The Spruce Eats crunched the numbers and discovered some interesting tidbits about the quintessential Christmas treat. Did you know, for example, that Southern states love tea cakes, while those in California and New Hampshire go for vegan alternatives? And in Virginia, ugly Christmas sweater cookies carry the day. 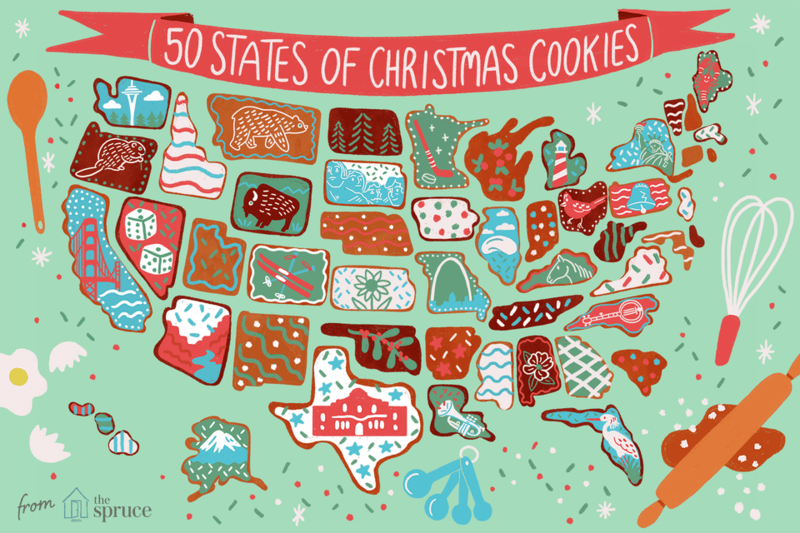 Unsurprisingly, interest in cookies spikes around the holidays—generally right around December 23—but states get baking at different times. The plan-ahead cooks of Illinois start at the beginning of December, while Nevada, Utah, and Oregon wait until the very last minute, with many sliding those trays into the oven right on Christmas Eve. Try mixing up a batch of the cookies that your home turf prefers or throw a cookie exchange with each guest bringing a different "state" for an all-American gathering. We guarantee Santa will be jealous. 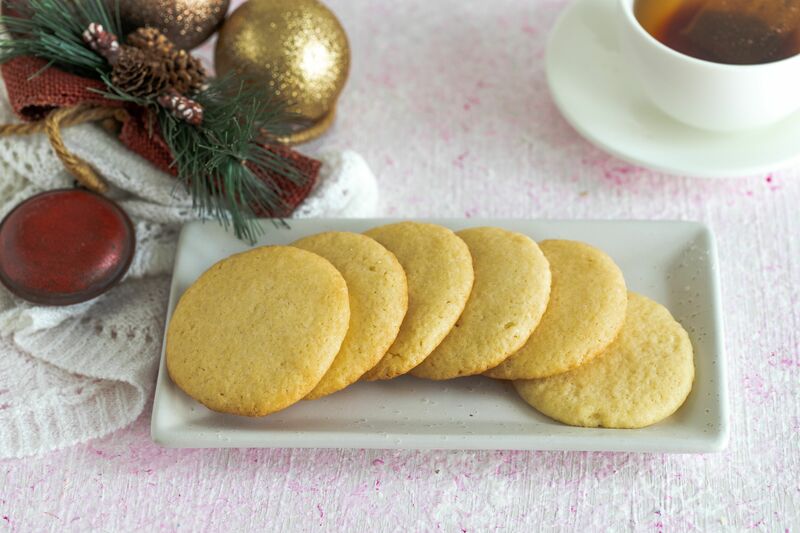 These simple, rich butter cookies go beautifully with a cuppa. Flatten each piece of dough with a glass dipped in sugar for extra crunch and some sparkle. If you want to get extra festive, colored sanding sugar makes a pretty—though not traditional—presentation. Delicate sesame seed crisps not only add a unique flavor to your holiday cookie tray, but they're also gluten-free. This recipe uses tapioca starch instead of xanthan or guar gum to help hold the batter together and sesame seeds even add a little extra nutrition. Make sure you toast the seeds before using for a deep nutty flavor. If you live in Arizona, you may already know bizcochitos, or anise cookies. The delicate, crumbly cookies use anise seed and cinnamon for a spiced flavor that pairs wonderfully with a mug of hot cocoa. Sprinkle a little cinnamon and cayenne pepper in your cocoa to kick up the pairing a notch. Tea cakes have a long history in the South and you can celebrate that tradition with these delicious vanilla-scented rounds. While many of them are rolled, this recipe makes drop cookies, so they're even quicker and easier to prepare during the holiday rush. Serve them plain or with a lemon glaze and sprinkle of poppyseeds. Wait, vegan bacon in chocolate chip cookies? You bet! Chocolate-covered bacon is having a moment lately and adding that salty-sweet combo into cookies is a natural progression. This recipe is savory, chocolatey, and so very indulgent—you won't be able to have just one. Anise can be a bit of an acquired taste, but if you like the licorice-like flavor, you'll love these bizcochitos. Whole wheat flour gives this version a deeper, nuttier flavor, but you can use all-purpose if that's what you have on hand. Feel free to skip the brandy or tequila if serving to kids. Crunchy on the outside, soft on the inside, these crescent cookies use almond paste to create their signature softness. Slivered almonds give the horns a great crunch and dipping the ends in chocolate adds a lovely, slightly bitter dimension. No need to toast the almonds ahead of time; they'll brown as the cookies bake. Instead of taking these vanilla and butter cookies out of the oven when they're pale golden, leave them in until the edges brown. That gives them a crispy, crunchy edge that contrasts wonderfully with the soft centers. Make sure to let the egg and butter come to room temperature before mixing for the best texture. Use both shredded coconut and coconut extract to give hearty Calypso cookies their signature tropical flavor. Pecans lend them a nutty crunch and rolled oats add to their heft. Best of all, they bake up in just about 10 minutes, so you can whip up a batch in a snap. Coconut is one of those flavors you either love or hate, and if you're in the former category, these are the cookies for you. Shredded coconut, pecans, and rolled oats give calypso cookies a hearty texture. They bake up quickly and transport well, so they're perfect for a cookie exchange. You've probably seen these nutty almond cookies at Chinese bakeries and they're actually quite easy to replicate at home. If you'd rather not blanch the almonds yourself, buy them already prepared that way. Expect the dough to feel crumbly before rolling it into logs and make sure not to skip the refrigeration. It makes them far simpler to shape. Chinese sesame cookies are traditionally made with lard, but this recipe uses butter and shortening instead. For extra nutty flavor, add a few tablespoons of toasted sesame seeds to the batter before baking. You can also use both black and white seeds for a pretty contrast. The unique flavor in these Greek cookies, or moustokouloura, comes from grape molasses, also known as petimezi. It's available at speciality grocery stores, but you can also make your own if you're up for a project. There aren't any eggs, milk, or butter in this recipe either, making it allergy-friendly. A rose by any other name does smell as sweet, and these powdered sugar-coated balls taste just as good if you call them pecan balls, Russian tea cakes, snowdrops, or one of their many other monikers. Whatever you prefer, their nutty flavor and crumbly texture make the powdered spheres a favorite around the world. ​​Dutch caramel cookies, also known as stroopkoeken feature the same gooey, caramel-cinnamon filling as the stroopwafel, except they don't require a special waffle iron to make. The discs have a slightly thicker, crispier bite than the traditional waffles. While this recipe calls for some traditional Dutch ingredients, you can substitute cake flour for the zeeuwse bloem flour or treacle for the keukenstroop syrup. For best results, use a kitchen scale for the metric measurements. The only way to improve on a classic, fudgy chocolate chip cookie is to make it bigger and this recipe does just that. A little yeast gives the giant cookies their puffy texture, while keeping the outside crispy and the insides chewy. Resist the urge to layer your cookie sheets in the oven; air needs to circulate around them to give them the right texture. Don't be intimidated by the long list of ingredients in these festive fruitcake cookies. They come together quickly once you gather them all. You can easily mix up the variety of dried fruit, adding raisins or cranberries in place of the pineapple or cherries. If you're serving them to kids, substitute orange juice for the bourbon, but it gives the cookies a great spiced flavor that adults won't want to miss. Buttery tea cake cookies are a great base for decorating, but they're also delicious all by themselves. Buttermilk adds a nice tang, but make sure you shake it well before adding. Sprinkle the cookies with vanilla or colored sugar before baking, or frost them once they've cooled for the kids to decorate. You'll feel like you're sitting in grandma's kitchen when you bite into soft, warming spiced molasses cookies. They go perfectly alongside a glass of milk or eggnog, and the ginger, cinnamon, and cloves will fill up the kitchen with a lovely aroma as they bake. Most of us know butter cookies as soft, pale golden rounds, but this recipe levels up with browned crunchy edges. Don't be scared to leave them in the oven until the edges crisp up, but watch them carefully so they don't go too far. The Greek name for these sesame seed-studded cookies, kouloura, refers to a round twist, one of their traditional shapes. They also come in braids or a simple S. Make yours in any of those forms or several different ones for a pretty, varied plate. Try this egg-free recipe for Polish vanilla cookies, or ciasteczka waniliowe, for a traditional European Christmas dessert platter. Ground almonds give them a great nutty flavor, but don't skip the vanilla bean—it lends these cookies a deeper aromatic scent than extract alone. You will need a krumkake iron to make these delicate, beautiful imprinted cookies. They're almost too pretty to eat, but once you smell them baking, we bet you'll get over that! Watch them carefully to avoid burning and serve alone, or filled with whipped cream and fruit. These simple tea cakes taste great alongside a cup of tea, coffee, or hot cocoa on a chilly winter day. Make sure you let your ingredients come to room temperature, to ensure they mix evenly and bake up properly. For a festive touch, flatten them with a glass dipped in colored sugar. If you like chocolate chip cookies, you'll love this twist on a classic, which also features creamy, nutty peanut butter. You can make the recipe friendly for other diets with non-dairy chocolate chips and gluten-free flour, and they'll turn out just as tasty. Use either creamy or crunchy peanut butter, to change up the texture. These stunning rosette cookies are molded in a special iron, fried until golden, then dusted with powdered sugar for a pretty addition to any holiday dessert spread. Before you get started, lay out newspaper with paper towels and place cooling racks on top of that to soak up the grease that will drip off the flower-shaped treats. That will make clean-up far easier, which is always a plus during the busy holiday season. Roasted peanuts give these classic cookies a delightful, nutty bite. Feel free to roast your own peanuts or buy them already roasted to save time. They only bake for about 6 to 8 minutes, making this a quick and easy recipe to whip up for a cookie exchange or holiday party. These crumbly, anise-flavored cookies taste great alongside a steamy beverage. They're perfect for a holiday cookie exchange, since they contain no dairy or nuts. Use either shortening or lard to make this recipe or a combination of the two. Avoiding animal products doesn't have to mean depriving yourself of decadent chocolate cookies. This recipe is allergy-friendly and totally vegan, but still feels as rich. If you can't find vegan chocolate chunks, you can also use chocolate chips. Add in chopped walnuts, pecans, or peanuts for a nutty twist. Use finely-ground walnuts in this crescent cookie recipe and don't substitute margarine for butter to end up with the right texture and flavor. If you don't have the right cutter, you can also roll them into balls and flatten with the bottom of a glass dipped in powdered sugar. Roll them in confectioner's sugar while they're still warm to form a nice glaze, then dust with more while cool. These crumbly, spiced anise cookies are popular in Santa Fe, so you may have already tasted them at a holiday party. The aromatic spices will fill your home with a delicious aroma as they bake, so make them just before hosting your holiday get-together to entice your guests to try them! Oil replaces butter in these kosher and dairy-free chocolate chip cookies, so they're also pareve and can be eaten with a meal that includes meat or dairy. They'll firm up as they cool, so don't be tempted to over-bake them. If you don't keep kosher or need pareve cookies, feel free to use regular chocolate chips instead of dairy-free. Thanks to the rich dates, these delightful finger-shaped cookies are sweet and indulgent without excessive sugar. Flaked coconut and chopped pecans add texture, while rice cereal keeps them on the lighter side. These cookies travel well, so they're a great addition to your annual swap. Are there fruits more festive than dates? These simple sandwich cookies take some time, but watch your guests' cheerful reactions and it all pays off. Make sure you leave yourself the afternoon to let the dough chill, then roll, bake, and fill the sandwiches. Grab a friend or the kids to make the assembly process more fun! When you need a change from the standard chocolate and wintery flavors, these pineapple turnover cookies will save the day. Their tropical flavor will transport you somewhere warm, even if it's a winter wonderland outside your window. Best of all, many of the ingredients are likely already in your pantry already. Yes, you can have the indulgent taste of double chocolate cookies with fewer calories. By using half the butter of traditional cookies and an egg white instead of a whole egg, these cookies have about half the fat of the usual suspects. Go ahead, have two—it's the holidays! These vegan pfeffernusse cookies might look like they have too many spices, but trust us, it makes a big difference. Black pepper gives the little balls a surprising kick, while molasses adds a caramelized, almost smoky sweetness. Using an egg replacement and vegan margarine keeps the recipe allergy-friendly and free of animal products. You won't be able to stop at just one of these crispy sand tart cookies. The trick is to roll them extra thin—about 1/8 of an inch—which gives them a crunchy texture. Just make sure to watch the oven carefully, so they don't burn. You can top them with half a walnut or pecan or slivered almonds before baking, or leave off the toppings and decorate them once they're cooled. These nutty butterball cookies are rolled in powdered sugar for extra sweetness, but it also gives them the same look as freshly-fallen snow. To make less of a mess, mix in the powdered sugar slowly on low speed. These simple and tasty date finger cookies are finger-lickin' good, and don't contain any chocolate or dairy. Whether you've got allergies in your family or just love the festive taste of dates and nuts, these are the cookies for you. The smell of these spicy ginger cookies baking will fill your home with a tantalizing aroma. You can leave off the frosting if you prefer, but the sweetness balances out the spice of the cookies, so we recommend using it. Make sure to measure the ingredients carefully and don't overmix so the cookies don't get too tough. Tropical-tasting slice cookies will transport your taste buds to warmer climes. Candied orange pieces give these holiday-worthy treats a seasonal citrus flavor that will stand out in the sea of typical chocolate and spiced desserts. These indulgent tea cake cookies are as tasty plain as they are decorated. If you don't plan to decorate them, go ahead and sprinkle them with colored or plain sanding sugar before baking, or frost and let the kids have at 'em. Carrot cake gets a new life in cookie form with these unusual cookies. Fresh orange juice really makes a difference in the icing, so don't skimp. For extra carrot cake flavor, sprinkle a little ginger and nutmeg into the batter before baking. Chopped hazelnuts give these snowy butter cookies a nutty flavor and tantalizing crunch. Finely chop the nuts for the best result and don't forget to soften the butter before mixing. Otherwise, they won't have quite the same texture. Looking for a way to take your ugly Christmas sweater party to the next level? These ugly Christmas sweater cookies are easier to decorate than they look and your guests will get a real kick out. Invite some friends over to decorate to keep the party going even longer. Scandinavian sweets have earned a reputation for a reason and these fattigman, or poor man cookies, are no exception. Since they're fried instead of baked on a fancy press like their "affluent" counterparts, fattigman are even quicker and easier to whip up. Don't be surprised if these will make it onto your annual cookie rotation. An integral part of any Norwegian holiday celebration, gaulette or gullet cookies only require a regular waffle or Belgian waffle iron to make. The dough gets pretty stiff, but the elbow grease is well worth it. If you can find a traditional gullet iron, even better. Is your cookie platter looking a little boring? These traditional Scandinavian rosette cookies will dress it right up. Be careful with the rosette iron, as it gets very hot while frying. Read the recipe all the way through before you get started, since it can get a little tricky your first time through. These soft, cake-y chocolate chip cookies are right at home at a bake sale, potluck cookie platter, or holiday party. They're easy enough to make with the kids, but delicious enough to serve to company, so add this recipe to your regular rotation. Sand tart cookies get their name because they look like sand dollars. Roll the cold dough very thin for a nice crispy texture, but watch them carefully when baking so they don't burn. Before baking, top them with slivered almonds, pecans, or walnuts, for extra crunch.